Bob Jacklin … Has been tying flies since he was sixteen years old, learning from such legends as Lee Wulff. Recently inducted into the Fly Fishing Hall of Fame, he has been honored for his tying, teaching, and angling expertise. At his fly shop in West Yellowstone Bob creates these patterns that “just catch fish”. Grey Wulff … This fly matches a variety of drakes you will find on Western waters. It can be tied in a number of sizes, has broad applications and is one you shouldn’t be without. Royal Wulff … For decades this was the most popular dry fly in Yellowstone Country, the Royal Wulff is still hard to beat. Bob ties it to perfection and in the way Lee Wulff taught him. March Brown Nymph … This is just a buggy looking tie that can work as an early stonefly or as a host of other nymphs. It is a sophisticated offering yet relatively easy to create. Green Drake … The largest mayfly to hatch in the Far West, this tie is done Wulff or Compara Dun style. It incorporates a variety of unique materials to make it stand out in a crowd. Platte River Special … This streamer pattern, developed in Wyoming, is now popular everywhere. Jacklin adds some creative twist and turns to make it a universal silhouette. Great Western Stonefly … The Salmon Fly, a beautiful mouthful of feathers, fibers, and fur, is not the easiest to craft. Bob shows you just how to make it look edible. This is an Awesome Fly Tying video. 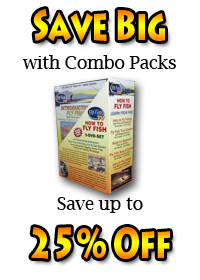 Bob Jacklin provides excellent fly tying techniques and instructions that can be used on all fly styles East and West. His personable and friendly manner make it very enjoyable to watch. Anyone starting to tie flies or planning to fish in the Western States should get this video.